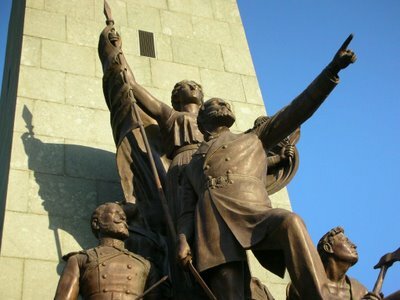 This statue shows Arturo Prat, one of Chile's greatest heroes, who died during the Naval Battle of Iquique, on May 21, 1879 (which is part of the War of the Pacific). The interesting fact about this statue, located near Forestal Park, is that under Prat's image you can read the letter that the Peruvian Admiral Miguel Grau wrote to Arturo Prat's widow after his death, recognizing the bravery of the Chilean hero. The author of the statue is José Carocca Laflor, the same of this one. Statue impressionnante et merci pour le texte qui va avec. Impressive statue and thank you for the text which goes with. I wish you good Sunday. the statue is as though alive! Stunning, In the reflection of the communist regime of the Soviet Union. It just asks for respect. Oh, the letter to the widow? I'm glad I'm not married to a revolutionary hero. As long as he drives safely, I get to keep him for another 30 or 40 years, I hope.